The pencil-thin black mustache always drives home the point for any sheriff, outlaw, or southern gentleman. Just think of what Clark Gable would have been like without his. Garbage. And who's gonna listen to a sheriff without the old soup strainer? Nobody. And let's not forget, what will the bad guy twirl when he's making his threats if he doesn't have the ol' mustache hanging from his lip? His eyebrows? Don't be silly. 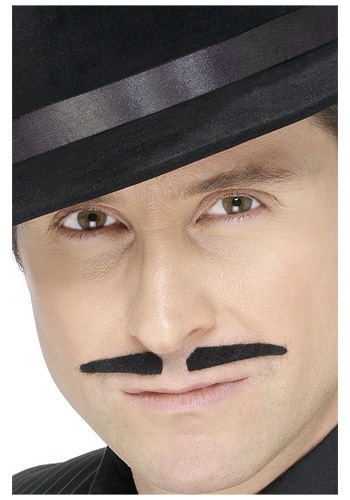 Get one of these bandit mustaches and complete your costume with some authenticity and dignity. Well, hello there, don't you look dainty in this Blossom Southern Belle Costume! 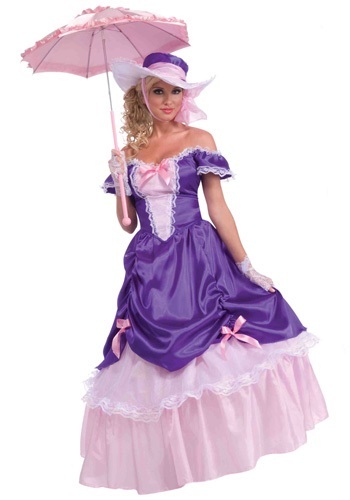 Now you can become the epitome of a lovely southern maiden with this beautiful purple dress, hat, and corset belt! Pick up a parasol to complete the costume! Scarlett O'Hara might have worn a dress like this Child Blossom Southern Belle Costume! It's lacy and shimmery and flowery, just like a true daughter of the South. A pink parasol and lace gloves will make it even prettier! "Oh hello darling, would you be so kind as to shield my fair skin from the sun's rays with my parasol?" This Southern Belle Costume will turn you into a dainty lady with a three-tiered dress. Become part of the true Deep South when you wear this exquisite dress and hat. You'll dazzle in this complete costume, but you'll have to supply the southern drawl yourself! Your little girl will love being the belle of the ball in this dress. 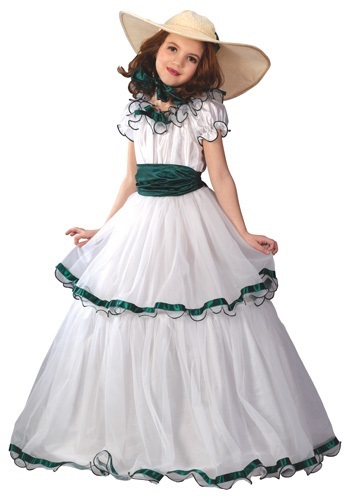 This Southern Belle Kids Costume is a beautiful dressed trimmed in pretty emerald green. The large hat that ties under the chin completes the whole dainty costume. 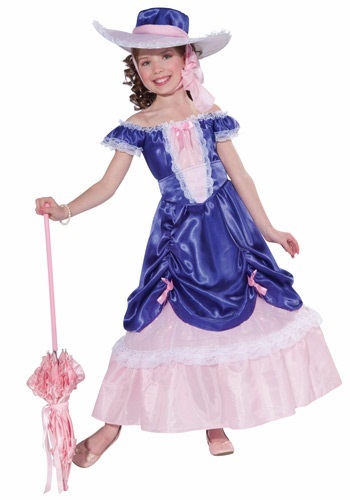 Any little girl who loves to get pretty and all dressed up will love wearing this costume. Unleash all your Southern charm and get in touch with your womanly values. Wear this Women's Gone With The Wind Scarlett O'Hara Dress will turn you into one of literature's most famous protagonist. You'll instantly feel like a high society pariah who mingles with Georgia's elite and indulges in the finer things in life. Will you win the affection of the Ashley Wilkes in your life? Only time will tell!